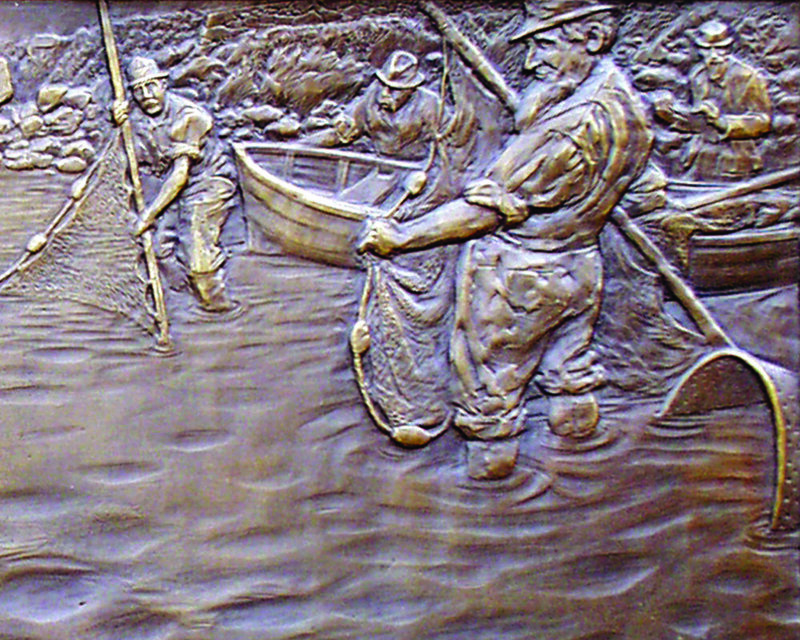 Looking Back: Falmouth at Work is a series of eleven bronze plaques made for the town of Falmouth, Massachusetts. The plaques represent many of the historic industries that were significant to the town. They are permanently installed along the sidewalk that abuts the library lawn on Main Street. Click here for a link to a thorough overview of how this public project was conceived and created. Each plaque measures 12" h. x 24" w. x 3/8" d.
Photo at right: detail from the Marine Sciences plaque, featuring Spencer Baird, the granddaddy of the Woods Hole science industry. Inspired by the plaques, a series of highly detailed articles about each of the industries in this series has been written by Falmouth historian Jennifer Gaines. They first appeared in Spritsail (Volume 21, Number 2: Summer 2007), a journal of the history of Falmouth and vicinity, published by the Woods Hole Historical Museum. A link to each article is under the corresponding photo. An introduction about the project and about Sarah's process can be found HERE. Read about Falmouth's Whaling industry that sailed out Woods Hole HERE. Read about the Shipbuilding industry and learn about "live oaking" in Falmouth and Woods Hole HERE. Read about how ice was harvested and stored for the summer months in the 19th century HERE. Read about Falmouth's Woolen's Industry and very different New England landscape we lived in HERE. Learn about the traditional and fascinating Cranberry Harvesting process HERE. Learn why 19th century New England sailors journeyed to the pacific islands to collect bird guano HERE. Read about The origins of the Marine Sciences in Woods Hole HERE. Read about the Strawberry Farming industry and its uniquely Portuguese origins in Falmouth HERE. Learn about how salt was harvested in 18th century Falmouth HERE. Read about the Wampanoag tradition of Eel Fishing and how the methods developed over time HERE. Learn the unexpected reasons Falmouth became a Summer Resort Community HERE.